It was a last minute goal by Brad Ebert that gave Port Adelaide the win over Geelong in the Australian Rules exhibition match at London’s Oval on Saturday. 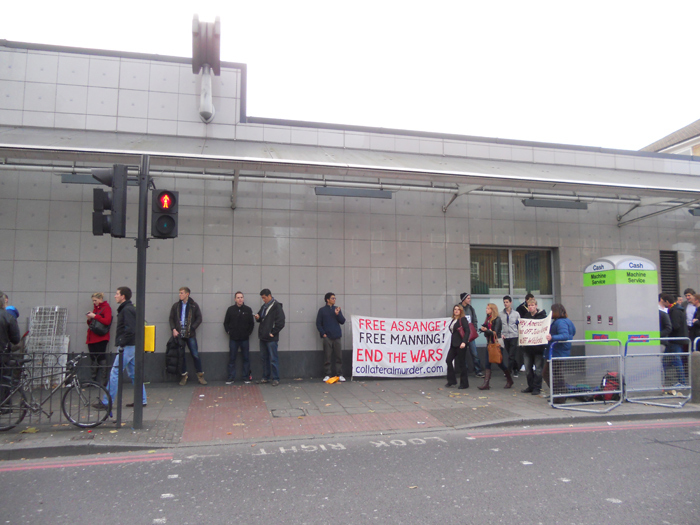 And it was a last minute idea to head out to the Oval tube station pre-match to engage the thousands of Australians heading to the game with the plight of their fellow London based countryman Julian Assange. Australians make up one of the largest immigrant groups in London. The Australian government has failed in its duty to protect the rights of Australian citizen Julian Assange being hunted by the U.S. for exposing war crimes in Afghanistan and Iraq. 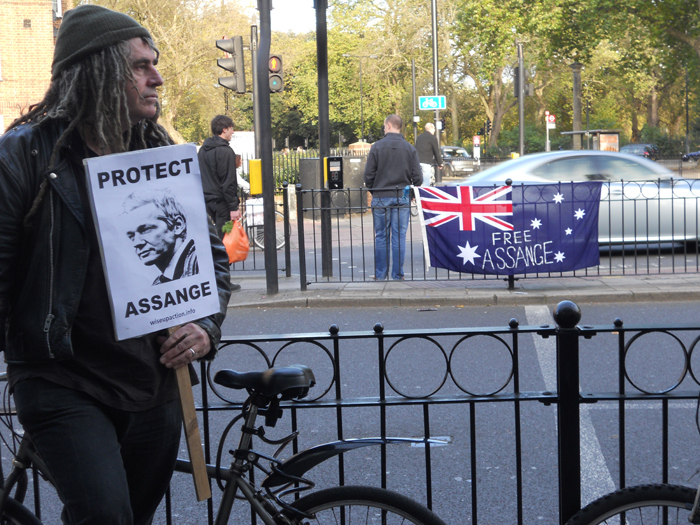 In 2010 while Julian was being held without charge in HMP Wandsworth a group of Australians occupied the Australian High Commission in protest at the government’s negligence in relation to him. Solidarity activists have been maintaining a daily presence outside the Ecuadorian embassy since Julian entered there close to 5 months ago. We have decided to complement the daily embassy vigil with mobile interventions when the opportunity presents itself. As we set up Saturday’s vigil at the Oval tube bottleneck, ticket scalpers acknowledged our presence and seemed surprisingly up to speed on the case. We distributed flyers to those London based Aussie footy fans who expressed interest and kept the case visible amongst this constituency. Australians Roland, Sue and Ciaron were joined by Sardinian Serena, Austrian Christoph and English Bob in this endeavour. Julian and Brad are in there for us, we’re on the streets for them! Solidarity vigils continue daily (2-5pm) outside the Ecuadorian embassy (take Harrods exit at Knighstbridge tube station). 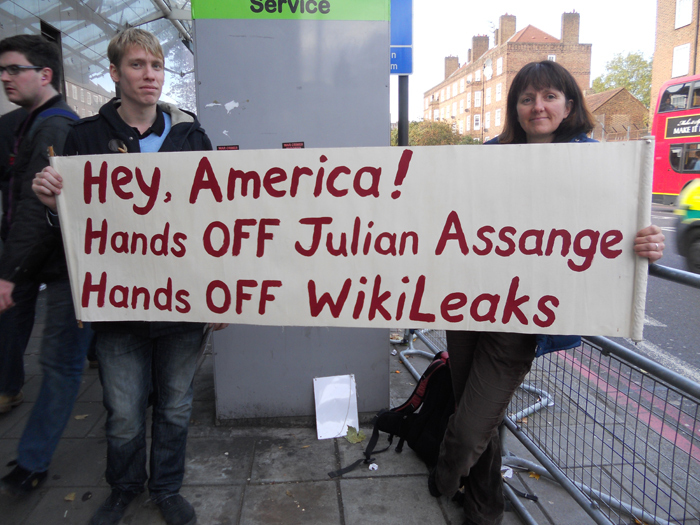 Gallery | This entry was posted in Assange, Reports and tagged Australia, Julian Assange, leafleting, vigil, WikiLeaks. Bookmark the permalink. It’s a good cause, he is man who has helped keep the world honest and has had to suffer for it.